Physics (from Ancient Greek: φυσική (ἐπιστήμη), translit. physikḗ (epistḗmē), lit. 'knowledge of nature', from φύσις phýsis "nature") is the natural science that studies matter, its motion, and behavior through space and time, and that studies the related entities of energy and force. Physics is one of the most fundamental scientific disciplines, and its main goal is to understand how the universe behaves. Physics is one of the oldest academic disciplines and, through its inclusion of astronomy, perhaps the oldest. Over much of the past two millennia, physics, chemistry, biology, and certain branches of mathematics, were a part of natural philosophy, but during the scientific revolution in the 17th century these natural sciences emerged as unique research endeavors in their own right. Physics intersects with many interdisciplinary areas of research, such as biophysics and quantum chemistry, and the boundaries of physics which are not rigidly defined. New ideas in physics often explain the fundamental mechanisms studied by other sciences and suggest new avenues of research in academic disciplines such as mathematics and philosophy. Advances in physics often enable advances in new technologies. For example, advances in the understanding of electromagnetism and nuclear physics led directly to the development of new products that have dramatically transformed modern-day society, such as television, computers, domestic appliances, and nuclear weapons; advances in thermodynamics led to the development of industrialization; and advances in mechanics inspired the development of calculus. Below are links to pages that are rated "Good Article" within WikiProject Physics from letters "A" through "L". The small good article icon ( ), which can be found on the top right corner of a rated Wikipedia page, symbolizes content held to a high standard on Wikipedia, although these have not reached Featured Article status. An arc lamp or arc light is a lamp that produces light by an electric arc (also called a voltaic arc). The carbon arc light, which consists of an arc between carbon electrodes in air, invented by Humphry Davy in the early 1800s, was the first practical electric light. It was widely used starting in the 1870s for street and large building lighting until it was superseded by the incandescent light in the early 20th century. It continued in use in more specialized applications where a high intensity point light source was needed, such as searchlights and movie projectors until after World War II. The 15 kW xenon short-arc lamp used in the IMAX projection system. A mercury arc lamp from a fluorescence microscope. 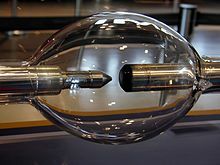 A krypton long arc lamp (top) is shown above a xenon flashtube. The two lamps, used for laser pumping, are very different in the shape of the electrodes, in particular, the cathode, (on the left). A krypton arc lamp during operation. 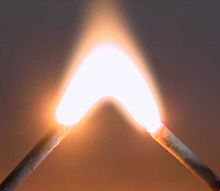 An electric arc, demonstrating the “arch” effect. ... that Femto satellites are the smallest types of satellites, and the Kalam SAT is the smallest Femto satellite ever made? ... that if the Andromeda galaxy were bright enough to be fully visible to the naked eye it would appear six times as wide as our moon? ... that your watch would run slower when orbiting a black hole than it would on Earth? ... that Aristotle's ideas of physics held that because an object could not move without an immediate source of energy, arrows created a vacuum behind them that pushed them through the air. ... that nuclear fusion reactions are probably occurring at or above the sun's photosphere; it is a process called solar surface fusion. ... that, in the Large Hadron Collider, protons move at 99.9999991% the speed of light when accelerated with the energy of 7 TeV? ... that, at a speed of 299,792,458 m/s, light can travel from the Earth to the Moon in 1.2 seconds? ... that the submarine telescope ANTARES, intended to detect neutrinos, may also be used to observe bioluminescent plankton and fish? ... that lasers can be used to separate two isotopes very efficiently? ... that neutron stars are so dense that a teaspoonful (5 mL) would have ten times the mass of the total human population? ... that every year, the Moon moves 3.82 cm away from Earth? ... that gold leaf is about 500 atoms thick? ... that the Big Bang was secured as the best theory for the origin of the universe by the discovery of the cosmic microwave background radiation in 1964? ... that Neptune was discovered by its gravitational pull on Uranus? ... that a touch flash releases about a billion photons a second far less produced in a particle accelerator? ... that homing pigeons wouldn't be able to navigate on Mercury because the planet has no magnetic field or atmosphere? ... that there are up to 6 candidates for the Theory of everything, minus String theory and Loop quantum gravity? Whether you are an expert or a novice, be bold, improve an article by editing it. Practice in the sandbox if you must. But hurry back to fix that glaring error that has been bothering you. 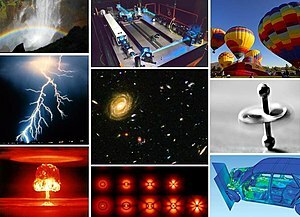 Watch the WikiProject Physics talk page for physics-related issues on Wikipedia. Add to Did you know and upcoming anniversaries. Add new Selected articles and Selected pictures to the queues. Fix a page needing attention: Modern physics, Classical physics and other physics topics. Check out other physics-related WikiProjects: WikiProject Science, WikiProject Fluid dynamics, WikiProject Elements. Add articles to your watch list.